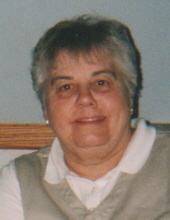 Age 77 of Owosso passed away Saturday, January 26, 2019 at Sparrow Health Systems surrounded by her loving family. Funeral services will be held 11am Tuesday, January 29, 2019 at Salem Lutheran Church with Pastors Paul Wilde and James Bare officiating. Burial will follow at Oak Grove Cemetery. The family will receive friends at Nelson-House Funeral Homes, Owosso Chapel on Monday from 2pm to 8pm. Sidney was born May 16, 1941 in Owosso, the daughter of Robert and Marie (Schlaack) Archer. She attended Salem Lutheran Elementary, Michigan Lutheran Seminary, and graduated from Owosso High School, class of 1959. Sidney enjoyed cross stitching and tending to her flower gardens. She had a love for animals but most of all Sidney loved spending time with her family. She married Lawrence Piggott at Salem Lutheran Church on December 12, 1964; he predeceased her in 1987. Sidney was a homemaker and healthcare provider. She is survived by her children Terry (Diane) Piggott, Tony (Lori) Piggott, Rick Piggott, Vicky Russell (Rob Kraszewski), Mark (Christine) Piggott and Jennifer (Randy) Palacio; granddaughter Megan Piggott; grandsons Tyler Palacio, Justin Piggott, Logan Piggott and many other grandchildren; sister-in-law Joy Archer; other loving family and friends; special friend Kathy Lang. Sidney was predeceased by her husband Larry; son Larry Jr; brother John Archer. Memorial contributions are suggested to Salem Lutheran Church and School. To send flowers or a remembrance gift to the family of Sidney Marie (Archer) Piggott, please visit our Tribute Store. "Email Address" would like to share the life celebration of Sidney Marie (Archer) Piggott. Click on the "link" to go to share a favorite memory or leave a condolence message for the family.